Use our ReCharge Subscription BuyBox block to offer subscriptions directly on your Zipify Pages! 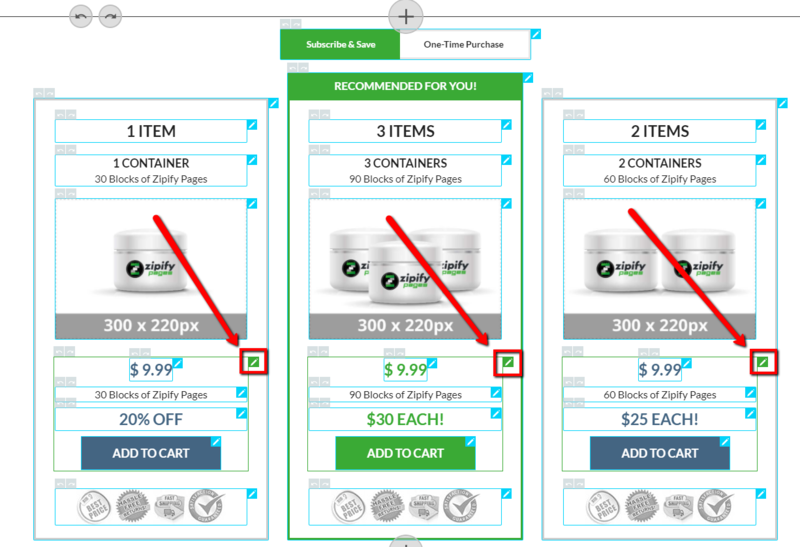 In order to add products into the block, you need to click on the green pencil icon of each product section. NOTE: This block will only show the ReCharge products which are configured as both “One-time & Subscription” type products. It will not show any products at all if you don't have the ReCharge app installed/configured and/or you have no “One-time &Subscription” type products. Once the product is selected, it’s added into both tabs at once automatically. It will show the one-time purchase product price for the “One-time purchase” tab and the subscription price for “Subscribe & Save” tab respectively. It will automatically apply the “Offer discount to subscribers” specified within the ReCharge app for the selected product. It will also automatically use the “frequency charge and ship” values from the ReCharge app. The frequency drop-down menu will only appear on the published page in the “Subscribe & Save” tab. NOTE: This block has no “Checkout” option for the button destination since the ReCharge app's checkout is initiated for customers from the Cart page of your store. You also have a way to edit the tabs of the switcher in terms of styles for active/inactive tabs. The text labels for the tabs themselves are being automatically pulled from the ReCharge app on your store (“Subscription widget” section). NOTE: When applying changes to a Shopify product, you also need to sync the changes to the ReCharge app in order to have them applied to the product there as well. After changes are applied or a sync is completed, it can take up to 2-3 minutes for the changes to appear in the Zipify Pages app. To add the ReCharge Subscription widget to any Buy Box block available in Zipify Pages, some theme file edits are required. See the information here for the details.